I came across a study recently that talked about the average household wealth in the United States, and it was broken down by race. When I started reading it, I thought there might be a small difference between white and black households, MAYBE a 25% difference. What I found when I continued shocked me. The median white household has a total wealth of $111,146 while the median black household has a total wealth of $7,113. That’s 15.6 TIMES MORE. Yes, I am aware that I am analyzing this from a position of fortunate circumstances. My parents were married when I was born. They both graduated from college (my dad in his early 20s, my mom in her mid thirties). My parents saved money and talked to us about saving money. My parents were home owners. My parents paid for me to go to college. I never had to help pay household bills, I never had to worry about the heat getting shut off. And none of these advantages had anything to do with me or my actions. I will add that I am raising two black kids and I am certainly not okay with them having only 1/16 the wealth of their white cousins. So Why Does This Massive Gap Exist? This issue isn’t simple. There’s a lot of history here going back to slavery, Jim Crow laws, and systemic housing discrimination, that can’t be fully addressed in a 2,000 word blog post. From my perspective, here are the major reasons and challenges. 72% of whites, almost 3/4 are home owners. Only 41% of blacks are home owners, that’s under 50%. This is huge when you consider that the bulk of household wealth in the United States is home equity. The home ownership gap is the biggest piece of the puzzle. Another factor is household structure. It is so much easier for a married couple to buy a house than for a single man or a single woman. Home ownership rates for a married couple is 84%, single men is 59% and single women is 51%. Why is this? Because if two incomes are working towards a common goal there is a larger portion of income that can be devoted to savings and investing rather than base needs. In 1960 74% of whites were married and in 2008 58% of whites were married. In 1960 61% of blacks were married in 2008 only 31% of blacks were married. Up until the late 1960s housing deeds prohibiting future sales to black people were normal. When going through Mrs. C.’s family’s documents and pictures I found a deed such as this from California in 1910. If you weren’t white you were locked out from being able to purchase homes in many neighborhoods. These weren’t isolated cases, these types of restrictions were extremely common. According to the U.S. Census bureau the median net worth of someone at age 65 is $194,226, with $130,000 of that wealth being in home equity. Which by the way, this illustrates a much bigger problem than the wealth gap between whites and blacks, Overall we as a rich country are ABYSSAL at building wealth. When sorted by median household wealth America is behind 15 other countries. For the richest nation in the history of the world this is pretty pathetic. It’s not like white people in America are doing all that great on building wealth either. 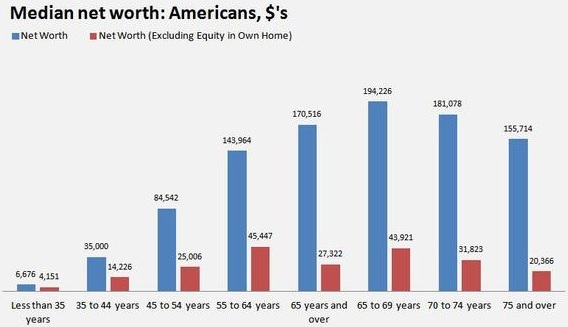 You’re looking at around $45,000 being the peak median non home equity wealth for households at any age in this country. I’m not any smarter than the average guy out there. I wear a hard hat and steel toes to work everyday. I am raising 4 children and started being a parent at 18, and I’m 31 years old. In the 12 years that I have been an adult I’ve built over a quarter million dollars in wealth. That’s well over the median wealth of all age groups in this country, and my best wealth building years are ahead of me. Not only does the wealth gap need to disappear, the targets we are shooting for need to be much, much higher. Black Americans shouldn’t be aiming to build the wealth that white Americans have on average, and white Americans shouldn’t be trying to get to the median wealth either. We should all be focused on blowing those numbers out of the water. According to a 2014 Federal Reserve study under 50% of workers had retirement accounts and only 13.8% of U.S. Households invest in the stock market directly (outside of retirement accounts). If you aren’t in the stock market you can not participate in compound interest returns. Black Americans with the same income as white Americans are 35% less likely to invest in the stock market. Investing $5 a day over 30 years in a total stock market index fund returning 8% will grow to $223,000. So $10 a day would give you $446,000, that’s about 10 times the current median non – home equity wealth for the age group with the highest median wealth. $10 a day people. Black people do not use illicit drugs more than white people, yet they are much more likely to be arrested and given jail sentences for drugs than whites. Getting caught with marijuana on you by the cops is FAR more damaging to your future and society as a whole than the damage smoking it causes. Check out the book The New Jim Crow for more information on how unfairly the war on drugs is enforced, and how it creates far more problems than it solves. 72% of the U.S. Population is white, 17% of the U.S. population is black, yet 37% of the prison population is black and 32% is white. When people get out of the criminal justice system they aren’t actually out. Most applications ask if you have been convicted of a crime. Although you have paid your debt to society and served your time, you still have to disclose this information, which will generally keep you from becoming employed. You are encouraged to have more children: The child tax credit is $1,000 per year (growing to $2,000 per year with the new tax bill in 2018). The Earned Income Credit maxes out with 3 kids and a total benefit of $6,269. So with 3 kids, you can get a tax return for almost $10,000, but to get it you can’t make more than $18,000, after that the Earned Income Credit start getting reduced fairly quickly. You are encouraged to be a single mom: From a tax perspective for a family with young kids it makes sense to not be married.Let’s say you are making $18,000 per year with 2 kids. If you get married to a man who is also making $18,000 and has no kids, your earned income credit drops $2,500. There is negative incentive to build an emergency fund: Food stamps get cut off if you have assets of $2,250. This isn’t necessarily the case across the board. Each state has the ability to relax this standard to some extent. Work carries a NEGATIVE rate of return: What if I told you a single mother of two would see NO improvement in net income if she made $15,000 per year or if she made $45,000 per year? This is the case in our welfare system, it literally traps people. The earned income credit, food stamps, housing assistance, and a variety of other social programs all have either drop offs like the Obamacare cliff, or gradual decreases as income increases. In some cases the drop offs are negative, where if you earn 1 dollar more you lose hundreds of dollars. Now all of these factors affect whites as well, however as a percentage of the population more blacks are trapped in the welfare system than whites. American culture as a whole is highly consumerist. We are bombarded with ads constantly and have a culture where we save on average around 5% of our pay, which is insanely low. Our highly consumerist pop culture seems to have a higher focus on blacks than on whites. Black people are urged to run really fast in the wrong direction with money. To many it is of very high importance to appear wealthy. Wearing $300 Jordans, driving an expensive car, wearing designer clothes are all activities that drain your capital and keep you from building wealth. Please check out this clip from Dr. Boyce Watkins from minute 6:30 to minute 09:00. “That’s exactly the mindset that is destroying the economic future of so many young people… A lot of the gap persists and keeps growing because no one is trying to close the gap. See people think that a gap is something that is just going to naturally close and so that’s why they’re shocked every time there is a study that says “oh my god the wealth gap between white and black people is as bad as it was in 1985.”, I mean, why would it close? It can only close, think about it like a race. If there is a gap between me and the person in front of me that gap isn’t gonna close just because its a gap. Just because we are both running doesn’t mean the gap is going to close. If I’m running slower than the person in front of me then the gaps not gonna close, its going to widen. If I start running backwards the gap is going to grow faster than its ever grown before. The greatest failures of our country is the lack of financial education in our compulsory education. Our kids spend six and half hours a day at school, 180 days a year for 13 years. That’s over 15,000 hours and in that time how much is dedicated to personal finance? In most school districts 0. 0 hours. When I went to school we had 1 class in high school that was a combination class called Gov’t/Econ, which lasted for half the year (90 days). Of the econ part, half was micro economics and half was macro economics, so only 45 days was left for economics and of those 45 days only 22 days were devoted to micro economics. 22 days for 1.5 hours is only 33 hours out of 15,000! It would be crazy to pretend that this is not a significant factor in both the lack of wealth in our society as a total and in the persistent wealth gap between whites and blacks in this country. As Dr. Boyce Watkins stated in the video above, A gap won’t naturally close, nothing will happen if you are standing still. So if very few people are actually running, we’re all standing around because no one even knows how to build wealth, then the gap will stay the same as it was 30 years ago. What if all our children Black, White, Asian, Hispanic, hit the ground running instead of standing still? This is the difference that education can have. People should not graduate high school not knowing how to invest, or buy a house, or build wealth. They shouldn’t graduate not knowing how to interview for a job, balance a checkbook, or start a business. If every child in America had 250 hours of classroom time dedicated towards financial literacy and building wealth they would all be running in the right direction and the head start many white kids have would damn near disappear. This is because if everybody is running the $104,033 difference in median wealth between whites and blacks becomes small, and overtime, irrelevant. When all my children are millionaires, it doesn’t make much of a difference if one has $100,000 more than the other. The difference goes from 1560% to only 10%. Since most of that difference is due to home ownership rates, simply by becoming home owners we can close a lot of this gap. And yes, ALL of our children can become millionaires. Despite the challenges there has been no easier time in human history for the masses to build wealth. 1. Insist that our schools teach personal finance, and insist that your kids are running the race. Standing still or running backwards is not acceptable. 2. Teach your children that money is for both consumption and capital, and that capital is by far more important. I’m using Stockpile to help with this. 3. Teach your children the importance of home ownership and help them learn how to buy a home. 4. I have come to believe that this is probably the best thing you can do for your children. Allow your children to live with you for an extra year or two to build wealth. You’ve taken care of them completely for 18 years, if you spend 2 more years with them living in your household, they can save 75% – 100% of their earnings, giving them a massive start in building wealth. Even if your child is working minimum wage and only 40 hours a week he could have $30,000 saved up in 2 years. With that money invested and no other money added by the time your child is 50 he will have $300,000. Look into other ways to help build generational wealth. As part of the deal they HAVE to show you the money being saved with bank statements and investment statements and demonstrate progress in education. My house has 2 future black millionaires and 2 future white millionaires. What are you doing to ensure your kids are running towards building wealth and not standing still? 9 Responses to "Examining The Wealth Gap Between Whites and Blacks In America"
and is limited to a lifetime total of 48 months. I have been retired from Dept of Children & Families for several years and those totals have not changed. There are limits on the number of children that are covered. If you have another child while on public assistance, that child receives 1/2 benefits and another child after that receives 0 benefits. Florida doesn’t care if they are married or not. If both parents are in the home, all income counts towards eligibility . I agree that financial literacy needs to be taught in our schools but from what I have seen of our regular teachers, that information needs to be taught by a finance professional and not a regular school teacher. Florida is currently considering a law to make financial literacy mandatory in our school system. It would be a step in the right direction. I added some clarification to the part about food stamps and included a link to the federal website. Yes it is a federal program, however states administer it and do have some flexibility in choosing the asset requirements. Thank you for the additional insight! It’s interesting how much assistance programs vary from state to state. Many great points and action steps, John. Your 4 kids are older than mine. What are some good age appropriate activities you’ve done to help them with their financial literacy? Am always looking for ideas to educate and empower the next generation. We don’t pay an allowance and we have a chore chart on the fridge with different jobs they can do. 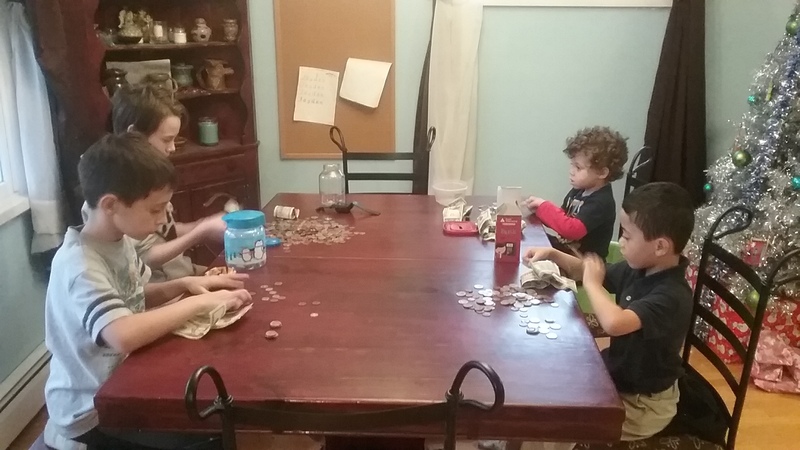 We add up their totals and pay cash at the end of the week into their piggy banks. There is a $5 per week max for each kid, excluding special items, like driveway shovelling or helping dad with a fallen tree. The kids are really good savers and don’t ask to spend their money very often. The two older kids have bank accounts for long term savings. The oldest is saving for his first car. They go with us shopping and even the little ones who are 4 and 6 know to always check thrift stores and ebay before buying something new. One thing I heard from the Dave Ramsey show years ago was that “more is caught than is taught”, so I have tried to steer away from lectures and I’m constantly looking for lessons in everyday behavior. For the older 2 kids (14 and 9) I often show them how much things cost as we buy things. I literally just signed up for stockpile and will write an update on how that goes with introducing the kids to investing. Long term I’d like to work on building some interactive lessons for the kids and doing 30 minutes of financial learning a couple days a week in the summer. Great ideas. Thank you, John. One caution with Stockpile: Their customer service has been difficult to contact. I gave two of my kids Stockpile gift cards for Christmas. One of them typed my e-mail incorrectly (They have to provide a parent’s e-mail.) and it’s not possible to correct within the interface. The only responses to e-mails to support were automated. We did finally get to speak to a customer service rep and she was very helpful but it took two calls with long waits on hold to get that far. I’m hoping that things are smoother and more enjoyable going forward. Yes, you absolutely can get both the EIC and the CTC. The EIC is fully refundable and the CTC just doubled to $2,000 per kid with $1,400 per kid refundable. This is a massive tax cut to low earners and lower to middle middle class families with kids.